A while ago, Ken Brown and I worked on a portable sign to promote DIYode at two events in the same week. It was made by etching our logo into an acrylic panel, and setting that panel onto a strip of LED tape in a wooden base. The sign has gone on to several more events, where it has drawn eyes from far away. It adorns our window at night, where the reflections from the lights wash up the blinds. I’ve had a life long love of cars and racing them. I’ve often dreamt of owning a nice sports car just to bring to the track on the weekends. I can stop dreaming now. Cause the computer based racing simulators today are just as good of an experience as any sports car I will ever afford. 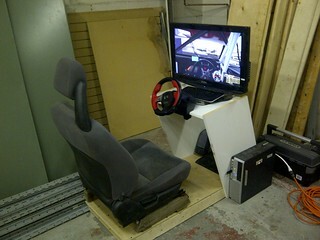 Building my own racing seat to go with rFactor as a computer racing simulator has been on my mind for years. So long in fact that I’ve dragged the passenger seat of a 1993 Honda Civic around with me since I junked it in the early 2000’s. Here are some more photo’s. There are still a few things I need to do before it is finished. Find a large enough monitor, mount the PC and paint it. But it works pretty well as is. I did not have any formal drawings before I built it. But it is very much based on a few existing Racing seats out there. Here are some links that helped me and may help you out. Come by during the DIYode Monday night openhouse (8pm-whenever) and give the seat a try! If anyone is interested in making one of these for themselves, leave me a comment. Who doesn’t like to play around with robots? Make them do cool stuff. So when I saw a six-legged remote control bug (called an N.S.E.C.T) at the thrift store I thought; that would make a cool base for a robot. The NSECT is supposed to be remote control but this one did not come with the controller. But otherwise was complete and worked. Along with walking on six legs it has a front pincher and a rear six shot gatling gun. First thing I did was take the entire thing apart. Here is a good page with a description and pictures. 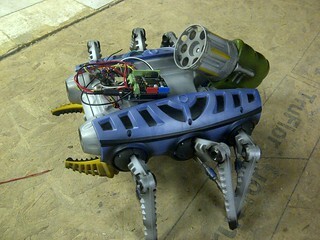 The legs are moved with a complicated set of gears and cams by 2 DC motors. One motor from the left, one for the right. Perfect for something like a motor driver chip to handle. I already had a Arduino Motor shield from Adafruit. But after some investigation I realized I’ll need something else. The Adafruit motor shield max’s out at 600mA per motor. The NSECT’s motors took 800mA+. I toyed with the idea of making an H-bridge motor controller from scratch but then saw a 2A motor shield from RobotShop in Quebec. I ripped most of the NSECT’s guts out and wired in the motor shield and Arduino. DIYode now has a good Robot Platform we can use to experiment with robots! I plan to add some IR sensors so the robot will be able to detect objects. Plus a biggie is to get the pincher working, and I won’t forget about getting that gatling gun working! 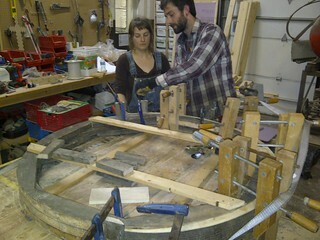 Erin and Andrew needed to build a circular crown for their yurt. 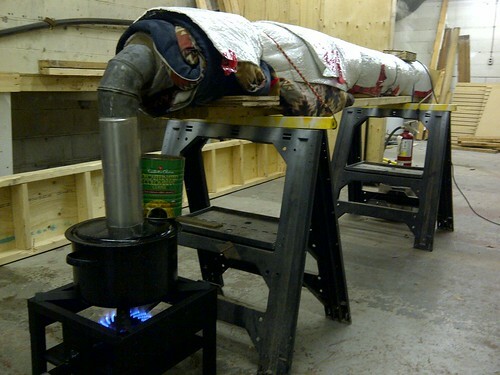 So they decided to steam bend it in a wood streamer they put together one day at DIYode. After 3+ hours of steam the wood planks were bent around the form. You need lots of muscle and quite a few clamps! More Steam Bending pictures and some video. Last Wednesday, I was reading through the morning’s DIYode IRC chat when I ran across an article that Jamie had mentioned. Someone had made a very attractive faceplate for LED light to shine through, similar to the control panel on some electronics. What had made it special was the high heat paint sprayed onto the acrylic beforehand, which produced a sharp, clean image. The site is here: http://hackaday.com/2013/01/16/one-method-of-fabricating-translucent-faceplates/. I got thinking that it would be interesting to make it wearable, like a necklace that glows. I asked the body of IRC chat people in our room what logo to use, and an answer came through just as I thought of the same one: OUR LOGO! I assembled the pieces, sprayed the paint, and enlisted the help of Mark Zander to help laser our logo onto small ovals. He also completely laser etched an oval to act as a diffuser. Mark worked on getting an itty bitty LED and an itty bitty resistor into the side of the etched oval. Something wasn’t quite right. We worked on it (well, mostly Mark worked on it) until about 9 that evening. The prototype was still not done. I went looking for “edge lit LED signs” in Google and found another site that was doing more or less the same thing http://grathio.com/2010/06/how_to_edge_lighting_displays/ . I had some LEDs at the house given to me by Dan O’Connell from Kwartzlab in Kitchener. I went to an electronics store to get a 3 Volt button battery, and tested the LEDs right in the store. Lo and behold, the green LED was just right, as our logo is green (sometimes). My plan was to use an unpainted acrylic oval, sanded on both sides, between the logos to act as a light diffuser. This was similar to the one Mark had been working on. Based on the second website, I thought that sanding both sides would produce better diffusion than laser etching for the sandwich layer, and it did produce a cloudy, whiter surface. I put it between the logos to test, and it seemed to work well. The LED got sanded and flattened with a Dremel tool. After cutting out a well in the top, I put the logos back to back with the cloudy layer between them to make it reversible. Sticky copper tape went around the perimeter, the LED got glued in with hot glue, the wires got soldered on, electrical tape went between the soldered ends, and then I popped a glass pony bead onto the exposed legs to hide them. All in all, this was a fascinating project. I’ll happily be wearing it to several events soon.